Attending aquascaping events have become the norm for me in the past few months, in part because I love watching the masters at work, but also because I believe they are an amazing way to promote our hobby. So both with the AQUADesign blog and youtube channel I can use them to do my share of helping aquascaping grow. I've attended workshops both in England, Germany and Portugal and had the pleasure to see some of the best scapers do their thing live. In the UK for anyone that follows this blog its not difficult to see the impact that George Farmer has had in the past few years. We now have events happening here on a weekly basis, we have shops investing in aquascaping and companies using them to put out their products. The aquascaping scene in here is still relatively small, if you compare it to the fishkeeping community and the amount of population in general. But still, looking back to what it is now, and what it was just a couple of years ago its safe to say, the future looks promising. This event took place at Aquarium Gardens, this shop is actually George's local fish shop, the owner Dave Pierce started selling plants online from home and with time the business grew to the point where he was able to invest in a shop. There's a couple specific traits to aquarium gardens, one the shop is known for growing their plants in hydroponic systems, so if you buy potted plants from aquarium gardens you will get fully grown versions of these, which in turn gives you more bang for your buck. The other trait is that they don't sell fish, originally I didn't really understand this except for the financial side of it, in that the initial investment to set up the shop would be smaller. But upon speaking both with Dave and George I can see the reasoning, the UK has a lot of fishkeeping shops, what it doesn't have is dedicated aquascaping shops, and Aquarium Gardens is one of those, George believes the future of physical shops is becoming specialized. Dave also explained that they have a large chain fishkeeping shop just a few minutes away and it would be hard to compete with them, so he says what happens is they have a kind of symbiotic relationship, Dave refers his costumers to them for fish, and they refer their costumers to him for aquascaping supplies. The other particular thing is that because George is local to this shop, he scapes some of their tanks, maintains them and they even have a deal going on as in if you buy a full evolution aqua the aquascaper setup from them, George will scape the tank for you if you are interested *. So sort of speaking Aquarium Gardens is George Farmer's headquarters, he even keeps an office in the shop and a good amount of the videos he puts up on a weekly basis are made there. The event took place on Saturday the 11th of November, we left London around 8.00 a.m and it was about an hour and half to aquarium gardens. The shop is located in Hungtinton in Cambridgeshire, the weather was terrible to say the least, we got heavy rain all the way. When we arrived there was already quite a few people in including George. When you go into the shop the first thing that pops out is the amount of display tanks, twelve if I am not in error, all of them nicely aquascaped. The large empty aquascaper 1500 was there just waiting to take its place as the centrepiece of the showroom. While George and the staff were preparing everything, I took time to have a walk around and see the scapes, I have seen these many times in videos, but it turns out they look even better live. My favourite was definitely the one showing off the biggest and healthiest java fern I have ever seen, but I also enjoyed the tank that was scaped by Jeff Senske and its minimalistic look. After a good look at the tanks I went on to see the rest of the shop, the hardscape area is clearly one of the best I have ever seen, and that is the sign of a quality shop, they also have a large tank full of plants, equipment wise the selection was top notch but is when you go to the back that you find the thing that really makes this shop stand up from the others, at the back there's a room entirely dedicated to the growth of plants using hydroponics. The plant pots are put inside this system and then grown with their roots underwater but the plants emersed. They are fully grown and provide a much bigger bang for buck than the regular potted plants. Soon the event started and George informed the audience that a one minute silence would be observed at 11 a.m as part of the remembrance day. This is a memorial day here in the UK to remember those in the armed forces who died in the line of duty. After that and as usual George began by introducing himself and talking about his work, in this case he also explained how he came to be the scaper on duty at aquarium gardens, Dave Pierce actually said he couldn't believe when he found out "The George Farmer" was actually local to him. After he talked a bit about evolution aqua "The aquascaper" range and he then moved on to the event details. The tank to be scaped was a massive evolution aqua "The aquascaper" 1500 tank, this 448 litre tank, with super white glass and minimal transparent silicone seams. The Glass is 15mm thick and the size is 150 (H) x 60 (W) x 55 (H) cm, the tank was massive and carefully placed as the centrepiece of the shop. The light units were two twinstar LED 600SP, these are pendant units and were kept in place by a stainless steel evolution aqua hanging kit. The filtration for this tank was to be two Oase biomaster 600 thermofilter filters, these are becoming well known for its pre filter which increases its efficiency while making them much easier to clean and maintain. K1 media and purigen was used and the filter was connected to glass lilly pipes. After explaining in detail all the equipment and tank George went on to talk about the scape he was planning to do, because the tank was massive and the shop was planning to keep it running as a long term display, something about two to three years, he had chosen to do a low tech aquascape. He actually brought in a prototype print out of what the tank would look like, he showed a picture that he said it was created for him by a friend of his from the Tokyo aquascaping union (TAU), which I suspect it was Steven Chong, even though the name was not mentioned. However the planned scape had been designed with the use of a large amount of anubias and due to a recent outbreak of anubia disease they had decided against following the blueprint to the letter. For those that don't know anubia disease also known as anubia rot, or rhizome rot, its a disease that causes the rhizome to melt, which then leads to the leaves falling off and the plant dying. Its suspected to be caused either by a bacteria or fungus and its very contagious, if you get this in your tank, by the time you notice it all the anubias in that tank are infected. They will just die one after the other. And I am not saying this because George said so in the event, I speak from past experience. So I completely understood the decision not to follow the initial plans, as tank that size full of anubias dying suddenly would have been catastrophic. 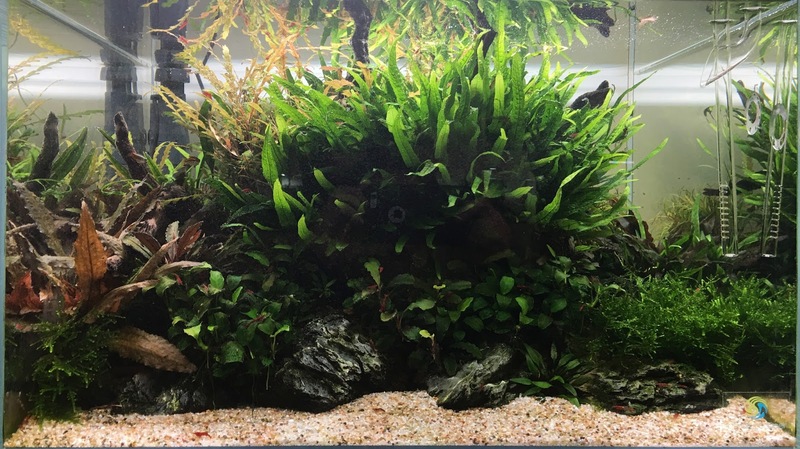 Instead the layout was still gonna be a Low-tech, because of its size Dave and George need it to be as low maintenance as possible, however instead of the anubias design planned they decided to for a Asian setup, using Plants and fish from Asia. Most plants would be crypts as they are from the region and fairly easy to keep. The first part of the setup process was adding the substrate, for this setup it was chosen to go for a mix of fertile soil from tropica and dennerle. The Dennerle substrate is the 9-1 version and it was explained that they have been experimenting with mixing different types of soil as they contain different types of nutrients. These two soils are incomplete substrates which mean they can't be used on their own, instead they need to be capped by either sand or gravel. The choice was made to use Unipac Samoa gravel. Some people in attendance did ask why not use just a complete soil like aquasoil. The reason pointed for this is that even though aquasoil type substrates are great for plant growth and possess a great amount of nutrients for the plants, they also tend to crumble and get messy as they age. George said that past the year mark, disturbing such a substrate tends to cause problems. 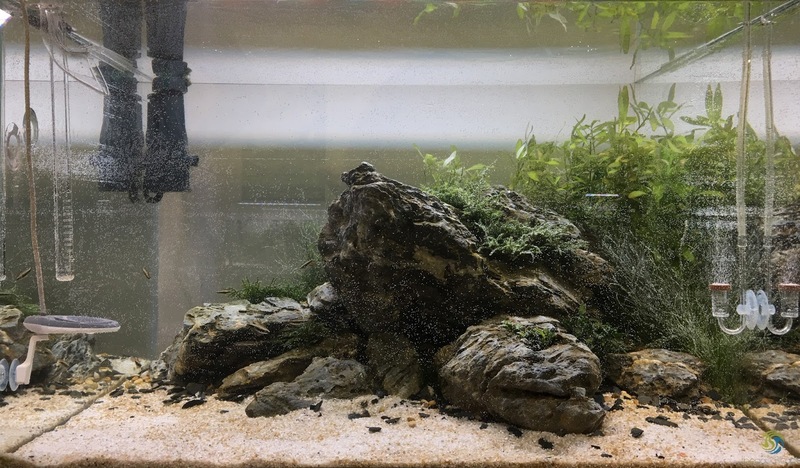 As this tank is planned for a long duration it made sense to go with soil capped with gravel instead, gravel is basically made of quartz so it does not age, degrade or crumble hence its much easy keep clean in the long run. After that the hardscape process started, the wood being used here was bogwood, but these are probably the largest pieces of wood I have ever seen in an aquarium apart from Lisbon's massive Florestas submersas. Five pieces were used and they were placed strategically to form a kind of U-shape layout with a pathway in the middle, the wood itself was placed strategically to reach different levels of height and depth in the tank, helping make the composition more natural, detailed and increasing the sense of depth. After that small branches were added, these were glued to the main pieces of wood using superglue, it is advised to use the gel type as the liquid version tends to just flow down the wood and rocks leaving unsightly white marks once under water. Also make sure the superglue is cyanoacrylate. 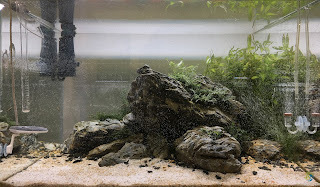 Finally it was time to add the rocks, Fossilized wood stone was chosen and these ones had already been used before by George in a previous diorama aquascape. He explained how to use the strata of the rocks to group them in a way that forms a composition that looks natural, they can also be used to keep the wood in place, though in this case its was not needed as the wood being used was large and heavy. It was around this time that we reached 11 a.m and the one minute silence was made as it had been announced in the beginning to mark remembrance day. After that plants started being prepared, it was nice to see the next generation helping out as George's daughter Florence was the one that lead the way in both preparing them and showing the audience in attendance how its done. As things started being prepared for the planting stage I took the chance to go out and have a snack, I left London around 8 a.m to go to Aquarium Gardens, but what I failed to mention was that before that I had worked during the night, so as expected it was now taking a toll on me and I was starving. So I went outside for about 20 minutes to recharge my batteries. When I arrived back planting stage had already started and both George and Dave were hard at work planting Marsilea crenata, this was to be used as a foreground plant, followed by cryptocorybe parva, this small crypt is easily the slowest growing carpet plant I know of, which makes it easy to keep, but also means it takes a lot of time to achieve a carpet. Marsilea was placed on the front of the foreground area, crypt parva was placed closer to the midground and around the hardscape. The midground was an assortment of different species of crypts that were not speciefied, these were placed in between rocks, wood, in the pathway and in some cases more to the back. By now the tank was starting to fill in nicely, crypts are known for melting easily when faced with slight changes in the conditions in which they are kept, however you should not remove the plant as this is normal and they will soon bounce back and grow again, this Is known as crypt melt. They are also known for being fairly undemanding plants that grow large, compact and beautiful the more they become established in the tank. There is a very large amount of crypts species, all of them very similar. So sometimes its really hard to distinguish them from one another. It took quite some time to plant this tank, way more than this blog, or even my youtube video about the event can transmit to my audience, so during this time a lot more stuff was happening in the shop, costumers kept coming in, people in attendance were having chats to one another, some of them even went to the point of using the shops practice tank to do some of their own scaping. One of these cases was Ryan Thang To, a very talented scaper whom I had the pleasure to work closely a few months ago helping George assemble a 1800 litre aquarium for another shop. It was clear by seeing Ryan work not only that he's really talented, but also the amazing potential that having a shop full of hardscape at your disposal can have on one's creativity. I also spend some time having a chat with James Sheen the founder of Blackwater UK and the Hampshire aquascaping and fish facebook group, he is an enthusiastic hobbyist, that knows a lot about fish, specially when it comes to biotope. I met him last year in Portsmouth at the anniversary event of his group, another event that hosted George Farmer building an aquascape. Its hard to get away from the fact that in the UK if there's some scaping being done somewhere, most likely he's the one doing it. The planting process was still ongoing and by now there was easily three of four people constantly going at it, the next step was to add bucephalandras, these are very easy to keep plants that are being very sought out for because they are beautiful. In terms of keeping them they are fairly similar to anubias, but they tend to grow even slower and this is something that should be highlighted. George made a case for only buying bucephalandras from a reputable aquarium plant brand, like tropica, dennerle or aquaflora. The reason for this is that these companies only sell bucephalandras grown in their nurserys. He explained that because they are easy to find in their habitats, but are slow growers the trading of wild caught bucephalandras has become a serious danger to the species with native sellers harvesting them without any concerns for the ecosystem or even the species survival. In essence this plant is being caught from the wild much faster than it can grow. If you want to be able to enjoy these beautiful plants in your aquariums make sure you only buy it from sustainable sources. After it was time to plant the background, the plant chosen was a stem plant called limnophila aromatica, its fairly easy to keep and its well known for the nice smell it realeases. Hence the name aromatica. After the background was finished and to add a final touch to the scape a few microsorums were added to the wood, the species used was microsorum pteropus trident. Similar to other species of java ferns but its leaves are thinner and fork of at the tips giving them a trident shape. Its a very easy to keep plant, considered to be even easier than other species of java ferns. With the planting complete it was time for the secret weapon to come out of the bag, the world renowned red colander took to the stage and the tank was filled. At this point the event was finished and after some questions and answers by George with the audience, most people left, I stayed a bit more and took the chance to buy two new aquascaping books to expand my collection an knowledge. Dave and George did a photoshoot of the tank and started preparing for a live Q&A on youtube at this point I said goodbye and left as I still had to drive back to London. Looking back to the event I really enjoyed aquarium gardens, its definitely the go to aquascaping shop in the UK, its quality but also its status as a specialized aquascaping shop makes its strong points. Also having George Farmer as a resident aquascaper, doing maintenance, assembling the displays and providing expert advice for your costumers helps put the shop at the center of places to go for any aquascaping enthusiast in the UK. On top of that Dave Pierce the owner is also an accomplished aquascaper himself which gives the shop an even bigger pool of talent from which to draw ideas from. As for Georges scaping, I have been to many of his events now, its almost routine for me now to look at the next George farmer workshop. He's always helpful in the way he explains things, you can actually go out and assemble a planted aquarium yourself just by seeing and listening to one of his workshops even if you are relatively new to the hobby. His scapes mix talent and creativity with the experience of someone who knows what works and what doesn't, both from a design perspective and from the perspective of maintaining it in the future. The Aquascaper 1500 assembled at aquarium gardens is a testament that one can create an intricate and detailed nature aquarium that doesn't become a burden to maintain in the future, every single choice made in the design of this aquascape was made to make it as easy to keep as possible while achieving the best layout as possible. I hope to see George one more time again on the 25th of November at the EAPLC party in Germany, after that I will move back to Portugal, so I will have less chances to see him scape live, but to anyone that has the chance to do it, don't miss the chance because he will clearly make it worth your time. With all the work he's been doing around the UK I can imagine he's inspired a good amount of people to take up aquascaping and in the years to come its quite possible a new generation of british aquascapers will step into the forefront, all of them inspired by George Farmer's love for the Nature aquarium. Here's a video I made of the event. Consider subscribing to the AQUADesign youtube channel if you would like to see more of these videos. And here is the full tank setup provided by Aquarium Gardens, special thanks to Dave Pierce for providing these. Filtration : 2x Oase biomaster 600 thermofilter with k1 media, purigen and glass lilly pipes. Please subscribe to the blog if you like what you read. * this offer is only applicable when buying a full system from aquarium gardens the aquascaper 600 or above.